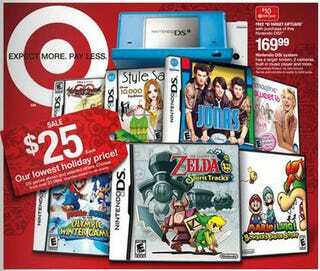 Target's goes video game bargain crazy this Sunday, with gift card cash back on the Wii and DSi, $88 bundled games, and select Nintendo DS titles for only $25 - including The Legend of Zelda: Spirit Tracks. Why did we rush out on to retailers on Black Friday again? This holiday season the retailers are dishing the deals all December long, and Target is no exception. Starting Sunday the 13th, the more sophisticated version of Walmart has bargains too ridiculous to pass up, unless of course you already got your holiday shopping done *grumbles*. Purchasing a Nintendo Wii or DSi from Target next week will earn you a $30 or $10 Target gift card, good towards the purchase of anything Target carries. Buy a slightly older Wii game, or just stock up on Choxie-brand chocolate goodness. Yes, I am plugging Choxie. I would fill my bathtub with Choxie products if I had the means, and then I'd get all upset because I forgot to clean it out first. Mmmm, chocolate raspberry soap-scum truffles. The Nintendo love extends to select Nintendo DS games as well, with The Legend of Zelda: Spirit Tracks, Kingdom Hearts 358/2 Days, Mario and Luigi: Bowser's Inside Story and more discounted to $25 a pop. No more putting off picking up the Jonas Brothers game for you, my friends. Finally,Target is cutting prices drastically on games bundled with plastic controllers. Rock Band 2, Guitar Hero World Tour, DJ Hero and Tony Hawk Ride are all dropping to $88, which is a substantial savings, yet still far too much to pay for Tony Hawk Ride. Oh, and they have Archer Farms stuff too. I could kill for a bag of apple pie trail mix right about now. What were we talking about again?